Reebok is delivering branded shoeboxes to all Crossfit Games athletes. But instead of a pair of shoes, they contain uncured, nitrate-free bacon. It's a brand extension designed to raise eyebrows and whet appetites. 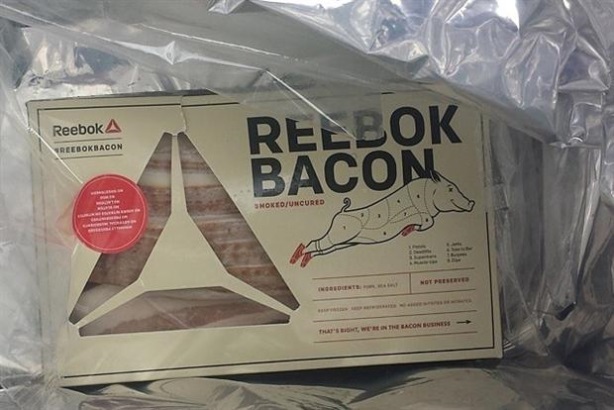 Reebok has entered the bacon market with the launch of a campaign promoting its sponsorship of the Reebok CrossFit Games. The Reebok CrossFit Games is a US tournament in which athletes compete for recognition as "The Fittest on Earth." This year, the sports brand has decided to play up its CrossFit association with a bacon theme, which is a reference to the Paleo diet favored by many CrossFit devotees. Reebok is delivering branded shoeboxes to all Crossfit Games athletes. But instead of a pair of shoes, they contain uncured, nitrate-free bacon. The company will also give bacon snacks to spectators. Reebok is also promoting the initiative on social media with the hashtag #ReebokBacon. The brand has also produced a video on its YouTube channel featuring athlete Austin Malleolo, who is seen cooking sizzling slices of bacon. "This is your brain on bacon," he tells viewers, referencing the famous anti-drug slogan "This is your brain on drugs." Did Skechers' ad poking fun at Nike's shoe blowout blow?